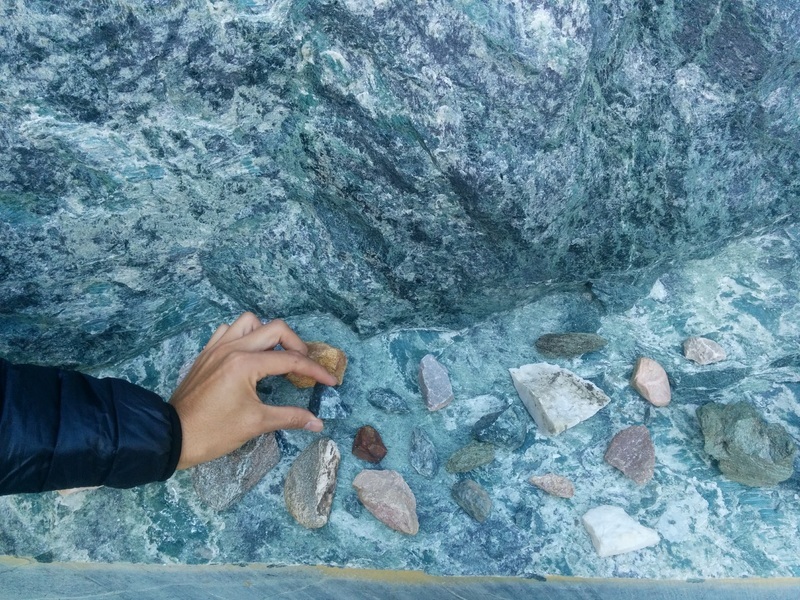  Public Lab: What rocks are native to Salisbury, VT? 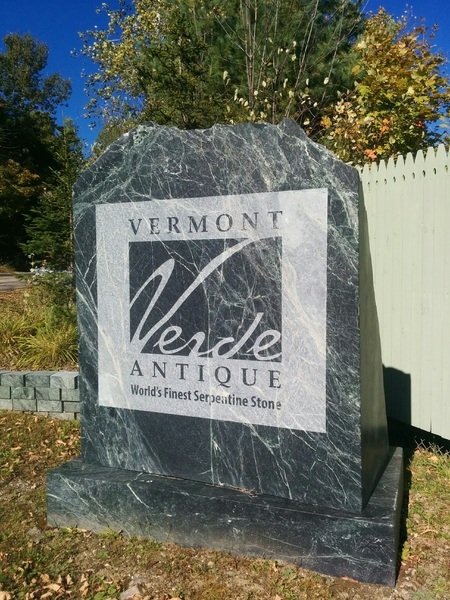 Question: What rocks are native to Salisbury, VT? 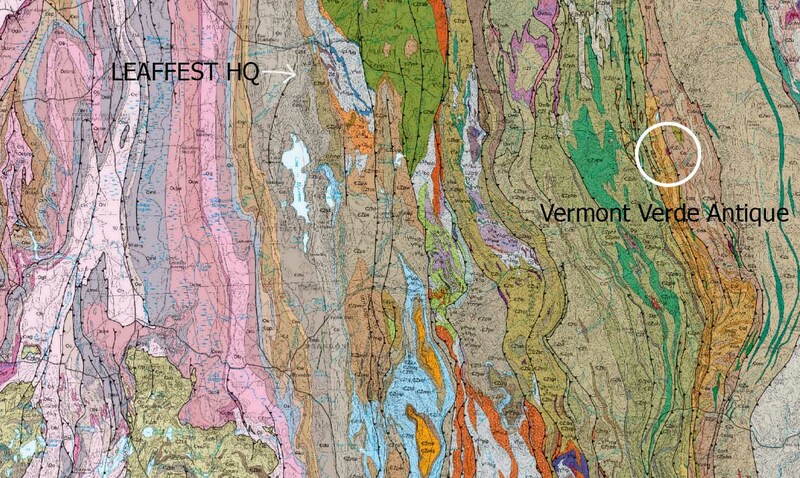 The bedrock under LEAFFEST HQ is Cheshire quartzite, a half billion year old Cambrian metasedimentary rock. It is buried deeply at the house under 100 feet or so of kame terrace and other unconsolidated glacial deposits. Bedrock geology in northeastern Salisbury VT. 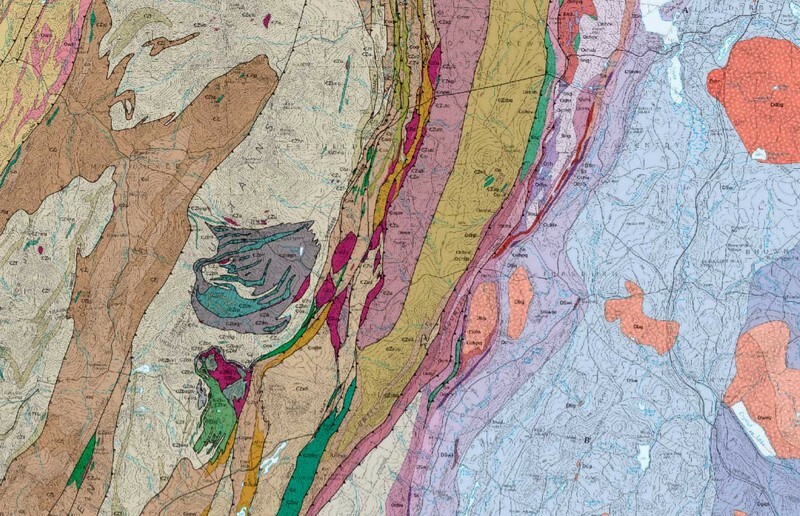 Detail of the 2011 Bedrock Geologic Map of Vermont. As we walked uphill to the east in the canyon of Halnon Brook, there were gray cliffs on either side of us which were probably Cheshire quartzite. 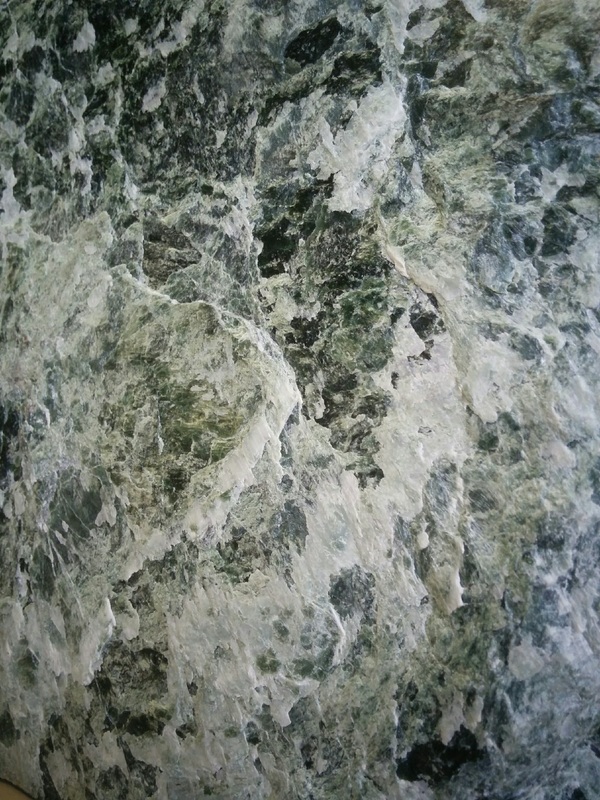 There is a lot of Cheshire quartzite around there, so many of the glacial boulders are Cheshire quartzite. Katie braved the ferns to examine the cliffs of half billion year old metasedimentary rock along Halnon Brook. This is probably Cheshire quartzite. 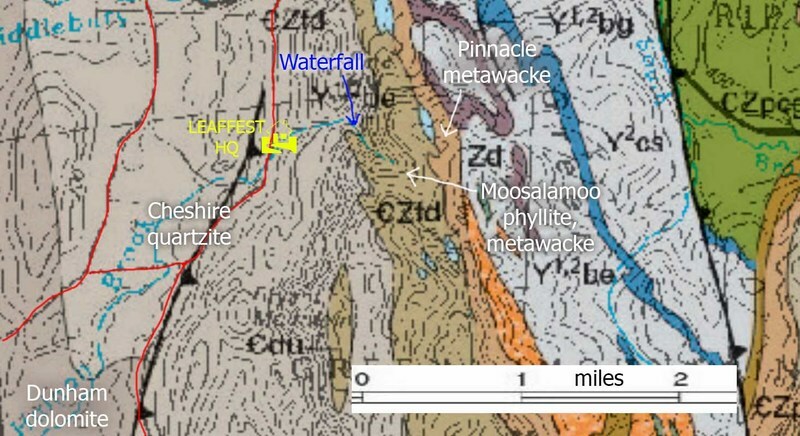 The base of the waterfall might be near the contact with the next major (and older) bedrock type -- phyllite and metawacke in the Moosalamoo Formation. Bryce and Katie inspect the bedrock at the base of the waterfall. The gray metasedimentary bedrock at the waterfall is very finely bedded, and could be phyllite or metawacke. The vein of whitish quartz was emplaced during one of the tectonic events which could have turned the graywacke into metawacke. The fine bedding structure is visible here and there appears to be an unconformity where the sedimentary layers were eroded away at an angle and then more strata were deposited. That all happened before the sediments turned to rock. Only one of us made it to the top of the waterfall. He did not report helpfully on the nature of the bedrock there. Below are descriptions of some of the rock types mapped in this area. OK, fine, answer accepted, no need for a local guide. Also, this is awesome. Did you have a different bedrock map posted earlier? Yes, I found that simplified map which I thought would be appropriate, but then I noticed that the polygons were not located very accurately. So I replaced it with the official map of bedrock geology. Green Area #1: Pinney Hollow Formation - phyllite member. Age: Neoproterozoic - Cambrian (1000 - 485.4 Ma). 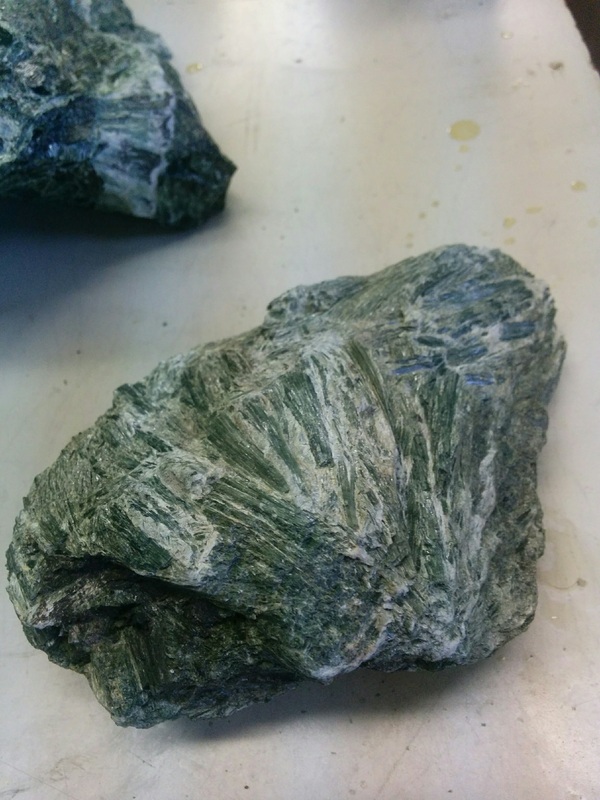 Green Area #2: Ottauquechee Formation - carbonaceous albite schist member (plus a bunch of other stuff) Age: Cambrian (541 - 485.4 Ma). Reference: Horton, J.D., C.A. San Juan, and D.B. Stoeser, 2017, The State Geologic Map Compilation (SGMC) geodatabase of the conterminous United States: U.S. Geological Survey Data Series 1052. 2862084. 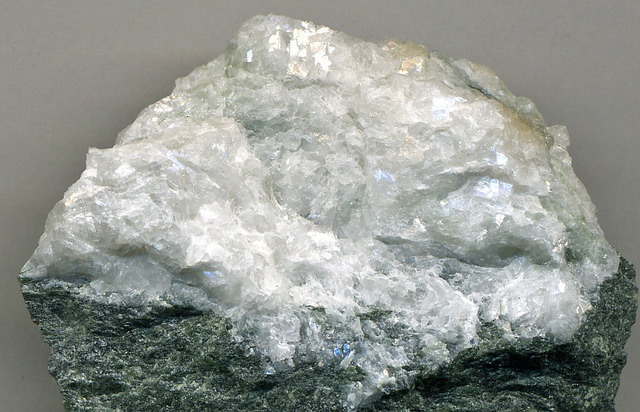 Serpentine is often associated with chrysotile, which is used to make asbestos, and further north near Belvidere Mountain there are plentiful outcrops of crysotile that were previously mined for asbestos. Beautiful and deadly! We spent a good part of the weekend trying to determine safety concerns around handling serpentine. 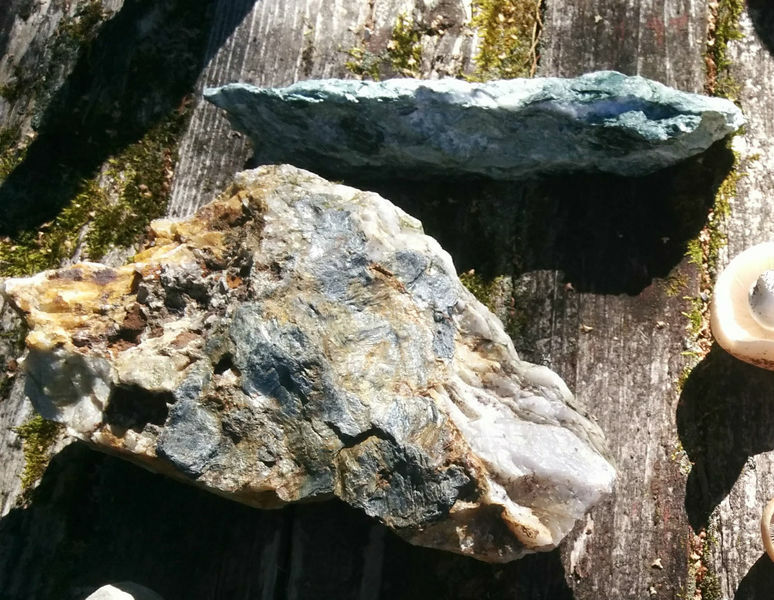 Below is an example of serpentine, pictured next to a larger piece of phyllite from the waterfall hike. I don't think the white overlays are chrysotile, but it seems entirely possible that it's interspersed. The big seam running through the top rock is likely magnesite, a magnesium carbonate, not quartz as we originally thought. The seam in the larger rock (I believe it's phyllite, picked up near the waterfall) likely is quartz. It is a very large example of crystalline silica, and is pretty much everywhere along these trails. Serpentine is located only in the quarry area; there were no examples that we found along the waterfall walk, which is consistent with the map. Back to asbestos. Here's a close-up of one of my rocks. Fibrous, but not fuzzy. I don't think it's chrysotile, but maybe related? Comparing the magnetite (in serpentine) and quartz (in phyllite) you can really get a sense of how multiple formations interact in similar ways, with cooling seams forming similar-looking crystal structures in very different types of rock (carbonate vs. silica). Similar structures, very different kinds of rock. Phyllite seems like it's pretty much ubiquitous, both in the Moosamaloo and Pinney Hill Formations and elsewhere. The ultramafic outcropping basically just in this one spot where the quarry is located. I like rocks and minerals. Also I'm a teacher and my kiddos love geology. Nice rock photos. This is really a comment on the previous answer, but if you leave comments in the comment place then you can't drag images in. And the following images highlight how crazy it is that you zeroed in on that tiny area of ultramafic bedrock. I knew there was a big serpentine outcrop at Belvidere mountain, but I didn't know there was a itty bitty exposure of it nearer to me. 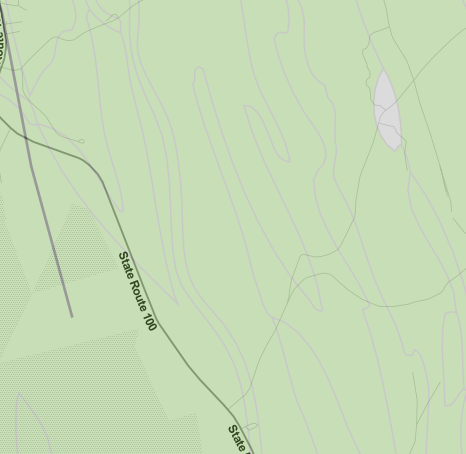 Above: The dark purple is the ultramafic rock near Belvidere mountain in northern Vermont. Above: This map is the same scale as the one above. There are a few tiny outcrops of ultramafic rock in the White River Valley. It's good to know they are there. Above: The dark purple map unit is Cambrian Zu. The story of serpentine is a great cautionary tale of expertise. 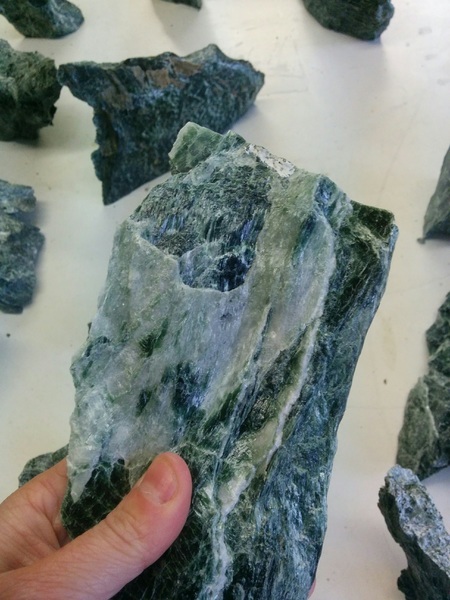 Geologists have known about serpentine for centuries, but when I was born, nobody knew that it is formed only at seafloor spreading centers which are where plate tectonics is driven by the creation of new crust. Nobody knew because nobody knew that seafloor spreading centers or plate tectonics existed. So the fundamental concepts which now organize the discipline of geology are younger than I am.